In different cultures the term weaning varies in meaning. However, in general terms, weaning begins at the introduction of the first solid food -as breastfeeding is no longer exclusive- and ends at the cessation of breastfeeding. When solids are introduced, breastfeeding is still highly beneficial and recommended until your toddler is at least 24 months of age, but if you’ve decided it’s time to partially or completely wean your baby off the breast, the following steps can help make the process easier. Talk to your pediatrician about formula recommendations. If you want your baby to drink breastmilk from the bottle, make sure you have an adequate supply stored. Prepare the bottle and present it to your little in a loving manner. Explain to him gently that he will receive his milk through the bottle from now on. If your baby resists drinking from the bottle, you can ask your partner or a family member for help. Your baby has learned to associate feedings with you, and may feel uncomfortable receiving it by other means at first. 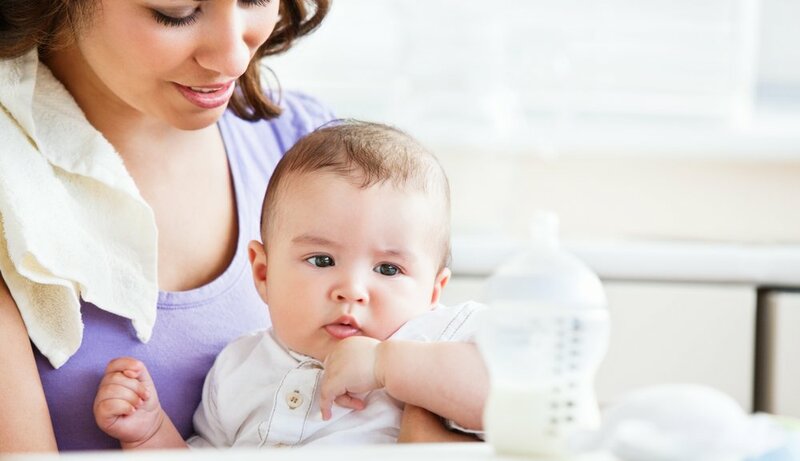 As your baby gets used to the occasional bottle, begin to feed him yourself. Continue supplementing breastfeeding with the bottle. Then slowly (or quickly) decrease breastfeeding every day until feeding him only from the bottle. Practice lengthening the time between breastfeeding, so your baby gradually gets accustomed to weaning. During this period, do not express milk unless you feel uncomfortable. If you eliminate only a few feedings each day, engorgement might not occur. However, if you speed up the weaning process, be sure to express some milk to prevent an infection. Breastfeeding works under the law of supply and demand, as soon as you decrease feedings, your milk supply will decline too. Try to introduce the sippy cup with a serving of water during the weaning process. Then gradually introduce milk in the sippy cup to prevent weaning your baby from the bottle later on too. Remember that weaning may be a gradual or quick process. Listen to your baby’s cues. Some babies will be ready to wean even before their moms are ready. It’s normal to feel a bit of sadness or nostalgia, but don’t worry, these feelings will pass when you see that your baby is completing new milestones in his development. Just don’t forget to be gentle with yourself and your baby during the process. Does frozen breast milk taste bad?